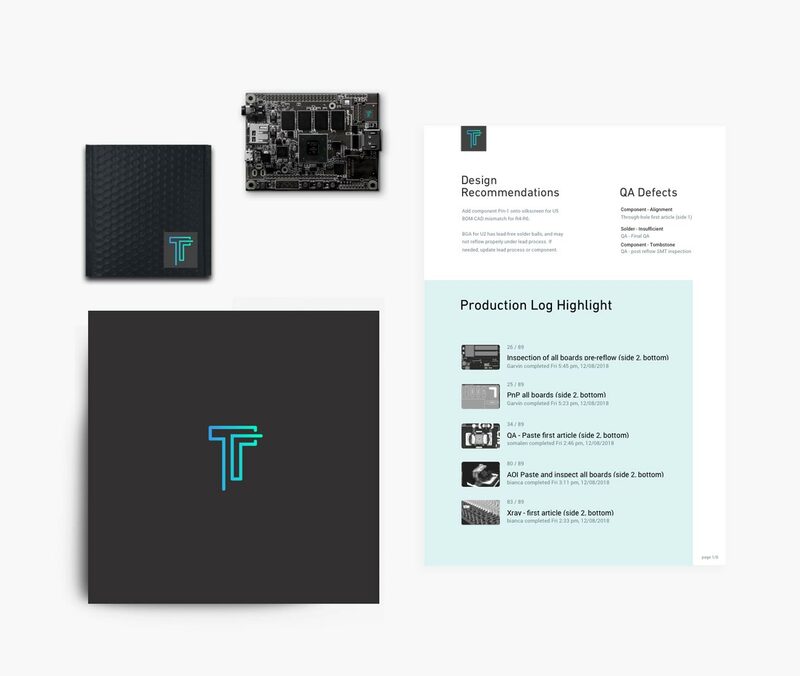 Tempo's streamlined process is designed to take your complex boards from design to desk in as fast as 3 days - in 5 simple steps. Upload your CAD early in the design process and receive real-time design feedback for manufacturing and component sourcing. Tempo’s system automatically analyzes your design for DFM and BOM validation. Tempo delivers rapid, quotes and lead times as fast as 3 hours. The lead times and prices quoted reflect your design and availability of required parts, and include an itemized breakdown of costs. If you update your design, we will quickly provide an updated quote. 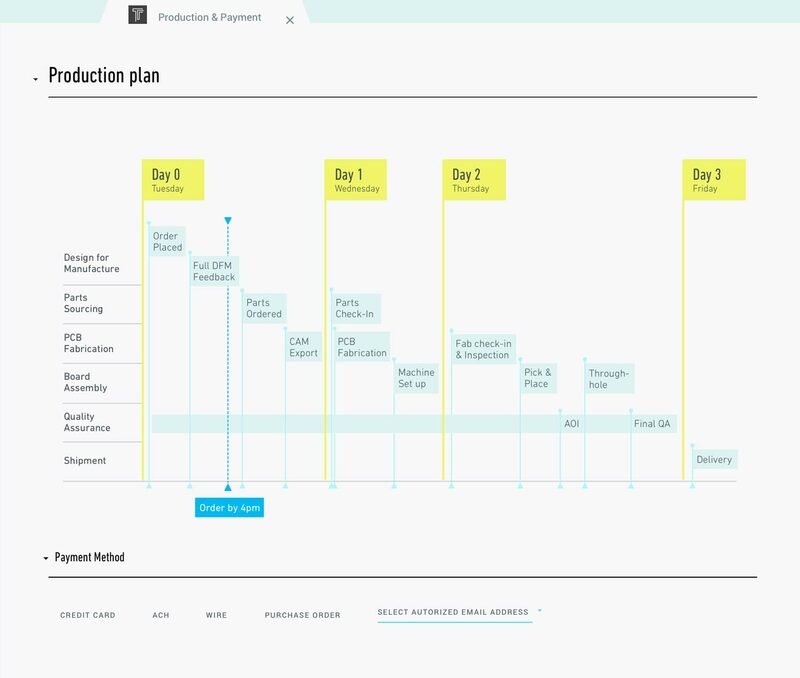 Tempo optimizes the order and procurement process based on our analysis of your design files and our real-time integration with our supplier network. We also offer a variety of payment options. No back-and-forth, all build. Less project management, more engineering. View and follow each step your boards take through design to delivery. Our system alerts you to the status of your board at every step of the manufacturing process. See and resolve potential design, sourcing and manufacturing problems before they become delays. We securely deliver your boards on time, accompanied by a detailed, transparent log of every process your boards went through. This comprehensive log includes full process and parts traceability with AOI and X-ray images to help you iterate your next design or take it to high volume. Bill of Materials (BOM), CAD, fab and assembly notes are automatically extracted from the native file. Non-native files are sent to Logistics for manual processing. The BOM is parsed and checked for part number ambiguity, quantity mismatches and other errors. 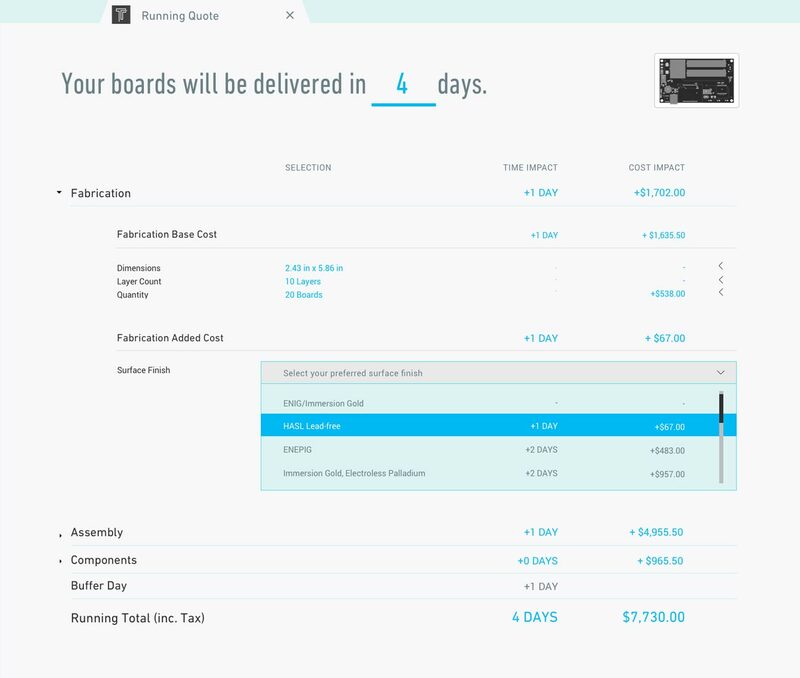 Quantities are compared to real-time supplies from component partners and any understock or out of stock components are flagged. You are given feedback on any flagged errors in a easy to use interface, streamling design file validation and eliminating back and forth delays. 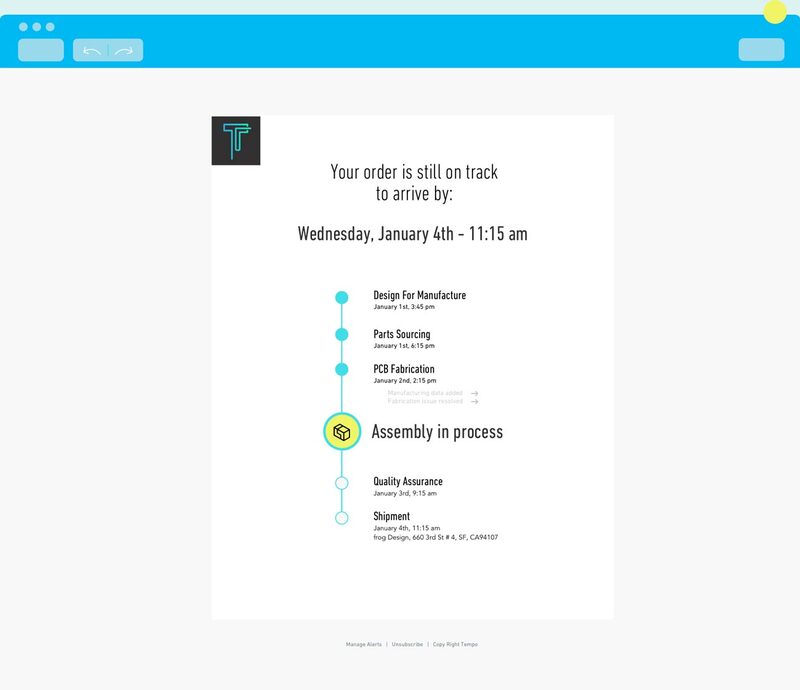 Fab and assembly notes are checked for stackup and build options. Complex designs that are beyond the scope of automated checks are sent to a DFM engineer for analysis. Once the CAD and BOM are validated, board data is run through the quoting algorithm which separates out board costs, component costs, and shipping costs. Fab and assembly pricing is based on over 30 different variables including layer count, feature sizes, and material choice, stack up, etc. Real time component prices are fetched from component partners and shipping costs are determined by zip code. Orders with special requirements are sent to Logistics for quoting. Payment can be made by credit card, ACH, wire transfer, or PO. Upon order a full DFM is performed on the board and if there are any issue you will be contacted. If all DFM issues are resolved by 6:00pm PST, the build is kicked off. Parts Sourcing: The BOM is sent to our component partners who compile the components and label each part with our in-house part numbering system minimizing kitting times. For consigned parts a shipping label is created and sent to you. All components ship overnight and are inspected and kitted upon arrival. PCB Fabrication: Design files are panelized and CAM created to our fabrication partners specifications ensuring fast build times. The PCB is manufactured and is shipped overnight. Assembly: The bare PCB and kit are run through Tempo’s in-house assembly line. Advanced machines allow for stenciless and fixtureless production which optimize the line for high mix and fast turn times. Quality Assurance: Each order goes through rigorous first article inspection where all process steps are validated. After first articles are cleared the remaining balance are assembled at high speed. Any manufacturing issues are recorded and you will be notified in your account and through email. After final QA, boards are securely packaged and shipped. Tempo uses Uber Rush, Fedex same day, or Fedex overnight to ship boards. The fastest method of shipping is always chosen. For ramping to full production, as-built gerbers, reflow profiles, and AOI training data are available to transfer to your high volume CM. For bring up diagnostics, AOI machine and X Ray images are available in your account. If design changes come up Tempo provides rework services with fast turn around. Tempo guarantees quality and will quickly resolve any manufacturing issues that appear.